Cesare Lombroso was an Italian university professor and criminologist, born in Nov. 6, 1835, in Verona, who became worldwide renowned for his studies and theories in the field of characterology, or the relation between mental and physical characteristics. Lombroso tried to relate certain physical characteristics, such as jaw size, to criminal psychopathology, or the innate tendency of individuals toward sociopathy and criminal behavior. As such, Lombroso's approach is a direct descendant of phrenology, created by the German physician Franz Joseph Gall in the beginning of the nineteenth century, and closely related to other fields of characterology, such as craniology and physiognomy. His theory has been scientically discredited, but Lombroso had the merit of bringing up the importance of the scientific studies of the criminal mind, a field which became known as criminal anthropology. Lombroso studied at the universities of Padua, Vienna, and Paris, and was later (1862-1876) a professor of psychiatry at the University of Pavia and of forensic medicine and hygiene (1876), psychiatry (1896) and criminal anthropology (1906) at the University of Turin. He was also the director of a mental asylum in Pesaro, Italy. Lombroso's main idea was partly inspired by the evolutionary and genetical studies at the end of the nineteenth century, and proposed that certain criminals had physical evidence of an "atavistic" (reappearance of characteristics which were present only in distant ascendants) or hereditary sort, reminiscent of earlier, more primitive stages of human evolution. These anomalies, named as stigmata by Lombroso, could be expressed in terms of abnormal forms or dimensions of the skull and jaw, assymmetries in the face, etc, but also of other parts of the body. These associations were later shown to be highly inconsistent or plainly inexistent, and theories based on the environmental causation of criminality became dominant. Despite the unscientific nature of his theories, Lombroso was highly influential in Europe (and also in Brazil) among criminologists and jurists. Among his books are L'Uomo Delinquente (1876; "The Criminal Man") and Le Crime, Causes et Remèdes (1899; Crime, Its Causes and Remedies). 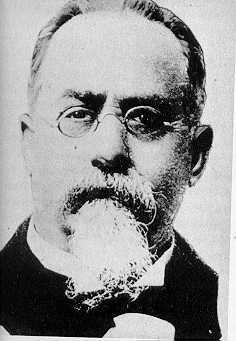 Lombroso died in Oct. 19, 1909, in Turin, Italy. From: "Phrenology, the History of Brain Localization"
In: Brain & Mind, March 1997.